As the faithful flocked to Lourdes, an ever larger sanctuary was needed. The Basilica of St Pius X, known in French as the Basilique Souterraine de St-Pie X, was consecrated in 1958 to accommodate the many pilgrims who come to Lourdes. As a casual visitor you might not even notice it, because it is built entirely underground! That was the solution to finding a place to house 25,000 worshippers without interfering with the approach to the main sanctuaries and the Massabielle Grotto. Built of concrete, it is, quite frankly, not much to look at. It does have some stained glass windows and various banners, but seeing it empty it's just that—empty. We did not see it full of pilgrims, when I'm sure its energy is very different. 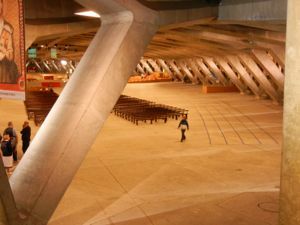 Above, Interior view of the Basilique St-Pie X, Lourdes, France.